Yarok Achshav organization urges public to burn bread, not packaging, in yearly chametz burning ceremony. The Yarok Achshav (lit. "Green now" - ed.) organization has called on Israelis to be careful while burning their chametz (leavened goods) Friday, and to remove all plastic bags and packaging from their chametz pile before setting it alight ahead of Passover. Pollution from the bags "constitutes a sin which stems from a mitzvah, and it's a shame," the organization's chairman, Tomer Yisrael, stated Friday. "I call on the general public to throw their chametz into the fire, and their plastic bags into recycling bins," he added, "so we will have a kosher, healthy, and happy holiday." 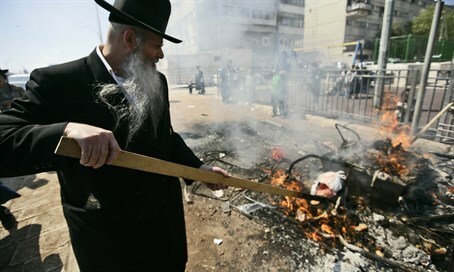 Israelis and Jews around the world burn their leavened foods, or chametz, every year on the morning before the Passover Seder. The ceremony inevitably leads to incidents with small fires, prompting warnings about public safety and safe fire rules every year.